Reetha(Soap nuts or Soapberry) is a round wrinkly fruit. Soap nuts are used for strengthening of hair and fair complexion. Buy(order) Reetha or Soap nuts online at whole sale price from KiranaPlace, a online herbs shopping store. Reetha(Soap nuts or Soapberry) is a round wrinkly fruit with a round black hard nut inside, outer skin color is reddish brown. Soap nuts are important Ayurvedic medicinal herb that is used for strengthening of hair and fair complexion. 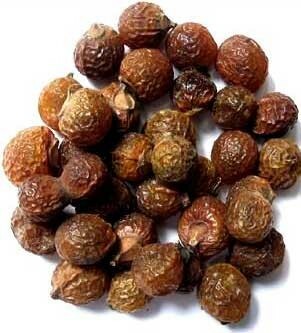 Soap nuts(Reetha) are also used to deep condition the winter wear in India. Reetha does conditions the hair from roots to tips. Reetha help to makes hair thicker. Reetha help to controls hair fall and dandruff. Hair Washing Method: Washing hair with reetha is a very simple procedure. Dipped 7-10 reetha after removing its shell into half litre of water. Left the mixture overnight. Strained it in the morning and apply on your scalp. Wash your head with clean water.